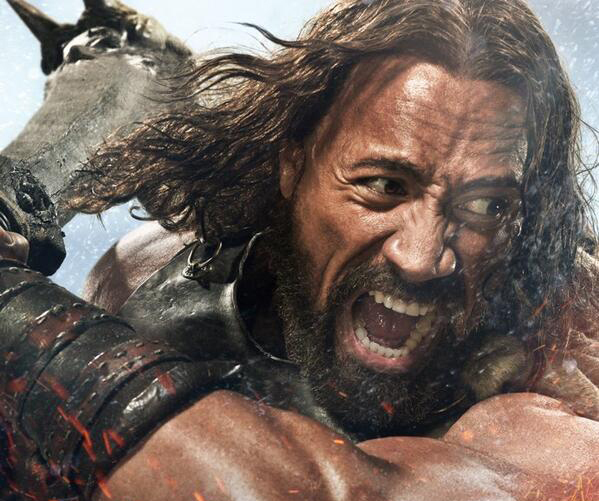 CinemaCon: The First Trailer for Hercules, Starring Dwayne Johnson! 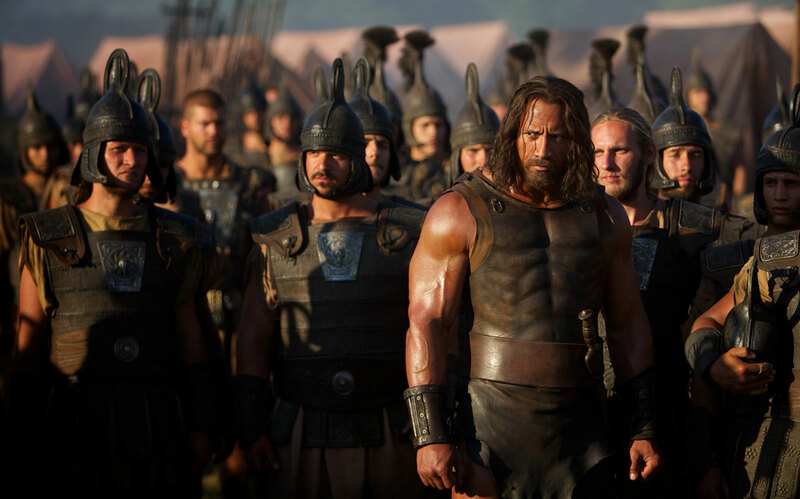 Based on the Radical Studios graphic novel "Hercules: The Thracian Wars" and directed by Brett Ratner (X-Men: The Last Stand), the action adventure also stars Ian McShane, Rufus Sewell, Joseph Fiennes, Peter Mullan, John Hurt, Rebecca Ferguson, Ingrid Bolsø Berdal, Aksel Hennie, Reece Ritchie and Tobias Santelmann. You can watch the trailer in the video player below, but earlier on Monday, ComingSoon.net had a chance to sit down with a small group of journalists to talk to Johnson about playing a character that's been a passion project for him going back over ten years to when he made The Scorpion King. Johnson's personal favorite Hercules was the very first one, played by Steve Reeves in movies from the late '50s to early '60s. "When I was a kid, I appreciated the movies and I was able to see them on VHS, but I was so enamored by the one-sheets and posters, like I always had one in my room when I was a kid," Johnson told us about his childhood hero during the 30-minute sitdown, adding, "You can't match his looks, he's a good looking guy, a movie star." 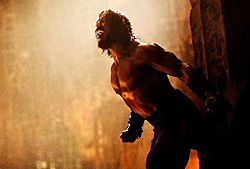 "When we meet this version of Hercules, he's gone through a tremendous amount of trauma and anguish of the fact that (his family is dead)," Johnson said as he skirted the subject on how Hercules' Godly lineage is handled in the movie. "When he's introduced in this story, he doesn't care about his faith and who everyone claims him to me. It doesn't matter to him, because he doesn't have his family anymore." In fact, Johnson plays an older Hercules, later in his life, and the movie starts out after he's already done his 12 labors, although we still will see quite a few of them enacted as flashbacks. 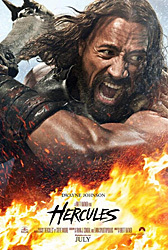 Ratner may have seemed like an odd or unconventional choice to direct a movie about Hercules, only because most of his previous movies have been set in present day, but Johnson seemed happy with the decision to have Ratner at the helm. "There was a lot of directors that had their hands up and we met with a lot of directors coming in. I thought Pete Berg was going to direct it and then we went in a different direction and met with a lot of directors. Brett came to the table very passionate about the project–as all directors do–but the difference with Brett (and I've known him for a long time) is that I got him at a very special time. He has had great success, he's been down, he's got back up and it's in that come-up where I was able to get Brett, where he knew he had this great opportunity and he was very passionate about Hercules and about doing something that was very special. Also, I got a very hungry Brett Ratner. He's a talented guy and a fun guy and it was good to see him at this level and raise his game." "There's been a few iterations in the past of Hercules," Johnson responded when asked about the movie's mix of reality and fantasy. "The idea was to take the spirit of the graphic novel, which we liked and then create a script and story based off of that that gave a unique twist on the story of Hercules, but also pay attention and pay respect and homage to the mythology of Hercules as it relates to the 12 labors and the group Hercules had around him, the anguish he had to go through with the death of his family. The goal was to try and strike a nice balance." Johnson spoke more on why the graphic novel played an influence on the Hercules movie he wanted to make. "It was taking a lot of elements of the mythology of Hercules and tweaking them where ultimately at the end, the greatest thing that Hercules can accomplish is accepting his fate and his faith, where his faith becomes his most valuable asset. We didn't want to rely on the fables and the fantasy element. We all felt that if we were able to strike the balance correctly, where we still paid homage to the labors and the story of Hercules, but also make sure it was rooted and grounded in something that was very real and that was palpable to us today and that is that you have great power when you find faith. Not necessarily a religious faith but the faith that things can be better." Possibly one of the more interesting aspects of the movie, especially in this day and age when revealing the look of a character often plays a huge role in people's perception, is that Johnson had been documenting the making of the movie over the six months in Budapest, Hungary without actually revealing his face. His pictures showed Hercules from the back or from odd angles but we never actually saw him with the long hair and beard as revealed in the poster. "The reasoning for that was to try and maintain the level of secrecy in terms of the reveal of what Hercules looked like, because it was going to be a complete transformation," he explained. "For me, as you see me today, I showed up in Budapest like this, so the transformation was probably about three-and-a-half hours a day. So in the idea of the complete transformation, we really wanted to do our best to make sure that it wasn't revealed, especially if we knew that it was going to be as special — or at least we hoped it was going to be as special — as we could create it. What we did was they got the best wigmakers in the world and beard designers and beard-makers, Oscar winners, all helping to create the transformation, so that's why it took so long. A lot of times in Hollywood, it's a lace beard that we put on, and they take 30, 45 minutes or an hour tops. This took two-and-a-half hours to three hours, because we had very long strips of yak hair, and they would cut them up probably an inch long and a quarter inch wide, and they would lay these on my face piece by piece by piece by piece. It was a very, very long process. But in that, what you get is something that is really spectacular." As SuperHeroHype readers know by now, keeping things secret on set is difficult in the day of smartphones, so they had to take some drastic measures. "The first couple of days of camera testing and seeing it and recognizing, 'Hey, we've got something really special. Let's do our best to make sure that nothing is revealed,' so there was a strict mandate that there were no cameras on set. I would say maybe close to 50 people were fired, crew members, all trying to sneak pictures. So there's that mandate, and we all agree on that, but then I told those guys at Paramount [and MGM], 'Hey, what I'd like to do is take the audience and the fans on a journey from beginning to end, because it's such a passion project for me. So from the time I get to Budapest, I'd like to take them on a journey in terms of what my diet is, what my training is and on set too.' They said, 'Well, how are you going to do that?' I said, 'Well, trust me. Somehow I'm going to do it.' So that's how we came upon all the pictures, however we could do it, where I wasn't necessarily showing my face, but giving the audience a taste of what it's like on set and how things have been going." "The tone is a nice even balance of 'Gladiator,' of '300,' and there's also personality in the movie and there's fun," Johnson said when asked how serious the movie would be, since the first trailer certainly has a very serious tone. "There's some wink that will make audiences feel good," he said as well as mentioning that there are a few one-liners. "I think that always makes the fun of creating a heroic character and putting your own twist on it and injecting my own personality in it." "The group of actors we had around, everybody came with their 'A' game, all ready to make something that was really special," he added. "All the actors came on board, knowing that there was another Hercules already being made, knowing that there were other versions of Hercules in the past, movies and TV, so everyone got together and really wanted to pay homage to the mythology and bring their own unique twist." 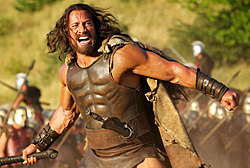 When asked about his process for coming into a character like Hercules compared to others, such as his character in Michael Bay's Pain & Gain, Johnson responded, "It's pretty much the same process, especially with those two characters, where they're a bit heightened, and yet at the same time you still want to ground them in some reality and some humanity. There's an empathy to them as well, because they're both big characters with a lot of things going on, and a lot of violence happening with both of these men. I have a specific set of tools that I like to continue to add to as the years progress and the movies progress, and then bring that to these characters. "I'm so grateful that I didn't make it when I first asked about it when I came to Hollywood 14 years ago," he continued. "I'm happy I didn't make it back then, because I couldn't have brought I think the same weight and substance, just living as a man and having the experiences I've had today. What I loved about this version of Hercules was that he was older and he was more experienced. When we meet him, he's going through a lot of pain, and he has no family, since his family's been murdered." While there are obvious comparisons to movies like 300 and Gladiator, Paramount will be releasing the movie with a PG-13 rating although Johnson said that they're pushing the limit on that rating, and that it really comes down to how much blood you see on screen. As far as whether what he's seen so far compares to his original vision of what he wanted to do with Hercules, Johnson thought carefully before responding. "It's everything I'd hoped it to be and more. You never know with a movie this size and scope and a lot of different elements going on, where if you're going to make it, you get one shot at it. It's not like an action-comedy or an action movie that plays today, where you have a little bit of leeway, latitude, with what you shoot and what you can get away with. With something like this – (that's so) epic in nature – it is Hercules, and he's the world's first superhero. There've been versions in the past, but we wanted to make the definitive Hercules. So going into it, there's a lot of unpredictability. You hope that everyone comes with their 'A' game, which they did. As you're shooting it, it feels good to you, but you never know, but you hope, and you have your gut sense. But in this case, yeah, it's everything that I'd hoped it to be."